Wednesdays, February 27 to May 1, 2019 10–11:15 a.m.
What has eyes but can't see? A potato, of course! Let's learn about the amazing spud, plant a potato bin in the Funshine Garden, and sing the Mashed Potato Anthem. We'll also use potato stamps to make fun artwork. Help crack the mystery of hte incredible egg! How are eggs formed? How do they hatch? Which animals lay eggs? 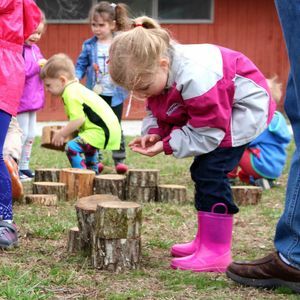 Young nature detectives will conduct an eggs-periment, peek inside our bluebird boxes, and hunt for eggs in the meadow.